Elite Support℠ Certified dealers deliver unmatched customer service and efficiency every time a truck comes in for maintenance or repair. Express Assessment is the commitment to provide a preliminary diagnosis and communication to the customer within 2 hours of arrival. All Elite Support Certified locations participate in Express Assessment. The ultimate goal of the Elite SupportSM Network is maximizing vehicle uptime. Every Elite Support dealership must be recertified annually to ensure you experience a consistent, higher standard with every visit across our network. 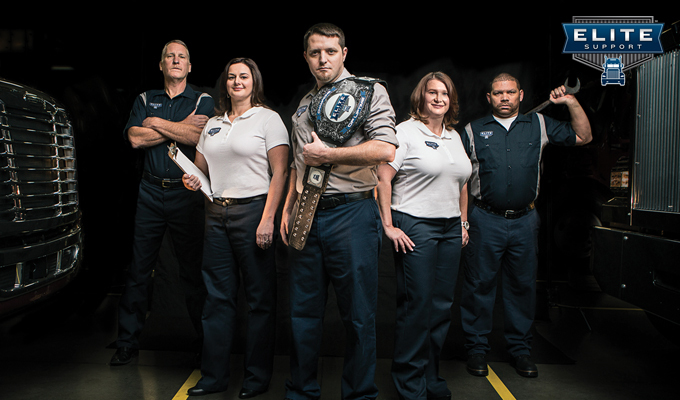 Our technicians receive continual training from the experts at Freightliner and Western Star. We focus on a solid understanding of all vehicle systems and have access to the latest tools to expedite repairs. Every dealership earning the Elite Support certification must meet 135 specific criteria across 22 customer service areas. To maintain these high standards, dealerships employ a Continuous Improvement Coordinator. Through the combined experience of our network and close collaboration with our service team, we understand what parts we need on-hand to get you back on the road quickly. Our data-driven stocking program, ensures that the parts you need are never far away. We know that when we service your vehicle, we're servicing your business. Elite Support Certified dealers believe in providing quality repairs and timely communication from a friendly and familiar team. Our facilities are designed to minimize downtime and provide a comfortable environment for drivers as we work to get your truck back on the road.